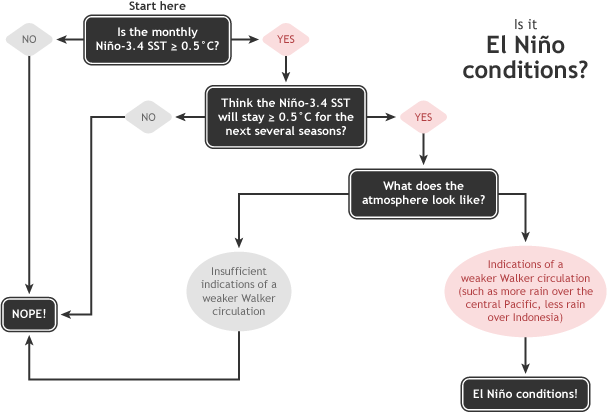 ENSO-neutral conditions still reign as of the beginning of the month, but we’re starting to see some clearer signs of the development of El Niño. Forecasters estimate that El Niño conditions will develop in the next few months, and there’s a 70-75% chance El Niño will be present through the winter. Most computer models are currently predicting a weak El Niño event. 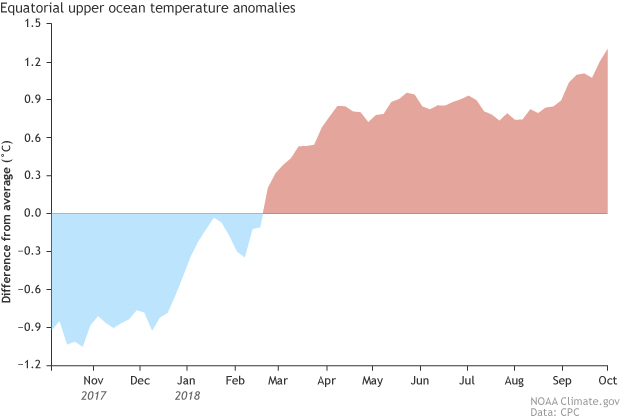 Animation showing sea surface temperature departure from the long-term average from August through early October 2018. Graphic by climate.gov; data from NOAA’s Environmental Visualization Lab. 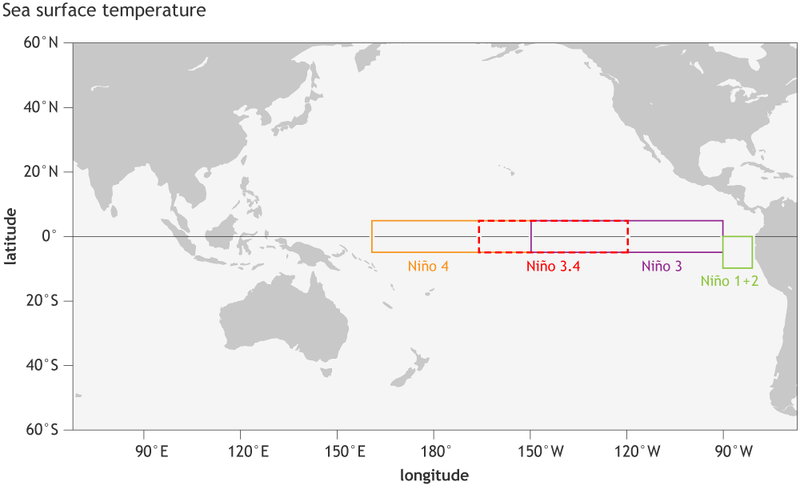 The temperature in the Niño3.4 region (our primary metric for monitoring El Niño’s development) was 0.7°C above the long-term average in the latest weekly measurement. Yep, that’s above the El Niño threshold of 0.5°C, but we’ll need the monthly temperature in the Nino3.4 region to average above that threshold, plus an expectation that it will stay above, and indications that the atmosphere is responding to the change in the ocean before we’d declare El Niño. Regular ENSO Blog readers will know that we go on about the winds that blow across the tropical Pacific. At times, we probably get pretty windy about the wind! That’s because these winds are very important to the development and maintenance of El Niño and La Niña. ENSO—short for El Niño-Southern Oscillation—is a coupled system, meaning the ocean causes changes in the atmosphere and the atmosphere in turn affects the ocean. The trade winds normally blow from east to west (“easterly” winds, in meteorological parlance) along the equator in the Pacific. They help bring colder water up from the depths of the ocean to the surface near South America and also pile up warmer waters in the far western Pacific, near Indonesia. When these winds slow down, the surface water can warm, and warmer waters from Indonesia begin to slosh eastward (a downwelling Kelvin wave). It takes a few months for the warm blob of water to travel across the Pacific, and when it reaches the coast of South America, the blob can rise to the surface, providing a months-long source of warmer water to the surface. 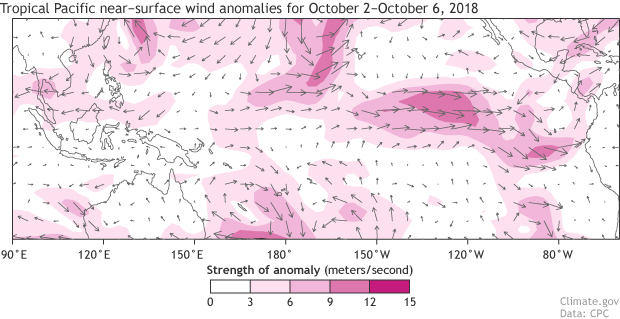 The reason I’m rattling on about this effect of the winds is that we’ve recently had a pretty substantial slowing down of the trade winds in the central and eastern Pacific—one of the strongest such episodes during September/October since 1979, when our real-time reanalysis data records begin. Wind anomalies (departure from the long-term average) during early October, 2018. Shading shows the strength of the anomaly; arrows indicate the direction of the anomaly. This slowdown in the winds has already allowed the surface to warm, and will help to reinforce the warmer subsurface waters that have been developing since August. The temperature anomaly in the upper ~1000 feet of the central-eastern Pacific, elevated since the spring, has increased over the past month. Area-averaged upper-ocean heat content anomaly (°C) in the equatorial Pacific (5°N-5°S, 180º-100ºW). The heat content anomaly is computed as the departure from the 1981-2010 base period pentad (5-day) means. Climate.gov figure from CPC data. The development of El Niño in the late fall isn’t unusual, with nine El Niño events since 1950 starting in August­–October or later in the fall. Of these, only one (1986-87) had a peak Niño3.4 Index greater than 1.0 degree; all the others were weaker events. Since El Niño events peak in November or December, there probably isn’t enough time for sea surface temperature anomalies to grow very large. The strength of El Niño doesn’t necessarily indicate the strength of its impacts on global weather. But a stronger El Niño can increase the likelihood that impacts of some kind will happen. The Climate Prediction Center’s winter outlook will be released next Thursday (October 18th), so stay tuned to see what effect El Niño may have on U.S. winter weather. We’ll also have a post here at the ENSO Blog on that outlook. Based on the current weather pattern and assuming we have a Modiki El Nino event. What year in the past would you say is the most likely to be. ENSO events are so different that we generally discourage using 'analogs' to say something about the future. We wrote a little bit about this here: https://www.climate.gov/news-features/blogs/enso/why-past-enso-cases-aren’t-key-predicting-current-case This case-to-case variance is why our climate outlooks (e.g. winter outlook 2018-19) are expressed in probabilities. Interesting to say the least!!! Yes! indeed it is, even though I don't begin to understand it! i dont konw much but.....when you measure el nino it is the temperture relative to a "long term average"..if theres global warming and the ocean is now .5 degrees warmer than the long term avergae wil this not effect the relative temperature differential? Our official index that tracks ENSO does use a de-trending process in an attempt to remove long-term trends. On the chart, only Australia and South America, but the entire AFRICA is affected by heatwaves. Please send me a map showing the El Nino effect & extent on AFRICA. The Climate Prediction Center’s winter outlook will be released next Thursday (October 18th), // Today is the 29th of October, where is that report located? the cost of Atlantic Ocean with heavy rains!!! Brazil:Rio de Janeiro, Vitória, Porto Alegre, Santa Catarina. Pacific centered on the Gulf of Alaska that has equal anomalies to that of those in the equatorial Pacific. My feeling is that this is the same set up that occurred during the 2015-16 season when there was supposed to be a major El Nino event but it fizzled out due to the persistent, stagnant high pressure ridge that was resident in the North Pacific. This ridge occurred largely as a result of the higher than normal SSTs in the N. Pacific. More attention needs to be paid to this phenomenon as it is clearly causing the recurring droughts in California and suppressing El Nino events as well. The ridge is back along with the higher SSTs, so this will be a minor El Nino.